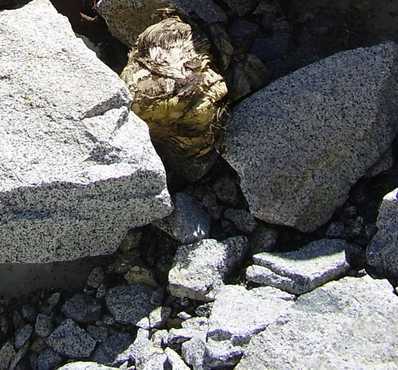 The parachute of a World War II-era aviator whose plane crashed on a glacier at 12,000 feet in the Sierra was discovered at the site. 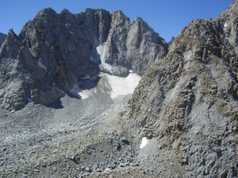 The body of the aviator is the second recovered from the doomed mission in the Kings Canyon area. Body is believed to be another member of training flight that crashed into a Sierra mountainside. November 1942: AT-7 training flight takes off from Mather Field in Sacramento. The plane crashes on Mount Mendel, killing 2nd Lt. William Gamber, 23, of Fayette, Ohio; and cadets John Mortenson, 25, of Moscow, Idaho; Ernest Munn, 23, of St. Clairesville, Ohio; and Leo Mustonen, 22, of Brainerd, Minn.
September 1947: Sierra Club hikers William Bond and Thomas Hodges discover the crash site while on a backpacking trip. Cadet name tag of Mortenson is found. Searchers later fail to find bodies. October 2005: Ice climbers spot the frozen intact body of a World War II airman in the glacier at Mendel. The body is removed, thawed and sent to the military's laboratory for analysis. November 2005: Analysts are able to read the name tag found on the body, but they will not release the identity until it is confirmed. Dental records have not helped. They seek DNA samples from the families of the four airmen. March 2006: Military officials in Hawaii identify Leo Mustonen as the airman whose remains were found on the glacier. Aug. 20, 2007: National Park Service retrieves remains from the Mount Mendel Glacier, about 100 feet from where Mustonen's remains were found. Authorities said Monday that a body found on a remote Sierra Nevada mountainside likely is that of a flier who died in a military plane crash 65 years ago. The body was discovered within 100 feet of where Leo Mustonen, a 22-year-old Army Air Force cadet, was found two years ago, Sequoia and Kings Canyon park ranger Debbie Brenchley said. Mustonen was aboard an AT-7 aircraft that crashed on a training mission in November 1942. Peter Stekel, an author writing a book about the crash, discovered the body Wednesday while doing research in the Mt. Mendel area in Kings Canyon National Park, Brenchley said. Stekel hiked out Thursday and arrived at a ranger station on Friday to report the discovery. Rangers flew by helicopter to the area Saturday to confirm the find, and flew there again Sunday to begin making arrangements to get the remains off the mountain. The body was being brought to the Fresno County Coroner's Office Monday for an initial examination and then will be taken to Hawaii for identification by military officials. Chief Park Ranger J.D. Swed said there are indications the remains are from the same plane that carried Mustonen, 22, of Brainerd, Minn. He didn't elaborate. Mustonen was one of four military aviators on an AT-7 training flight from Mather Field in Sacramento that strayed off course on Nov. 18, 1942. A blizzard is believed to have been the cause of the crash on the 13,691-foot Sierra Nevada peak, according to weather reports. The crash site was not known, until two years ago. Others on the flight were: Army cadets John Mortensen, 25, of Moscow, Idaho; Ernest Munn, 23, of St. Clairesville, Ohio; and the pilot, 2nd Lt. William Gamber, 23, of Fayette, Ohio. Brenchley said the body was found in a rocky area at 12,300 feet of elevation. To get to the area requires hiking more than 25 to 30 miles. Unlike Mustonen's body, it was not encased in ice. Brenchley said the head, torso and most of the arms were visible. A parachute was found near the body. It did not appear that the man had tried to open the parachute, she said. The body was likely hidden by snow when searchers were nearby in 2005, she said. This year's snowpack was only 29% of normal. Fresno County Coroner David Hadden's office is cooperating with the military's Joint POW-MIA Accounting Command in Hawaii. In a conference call, the command's deputy scientific director Robert Mann said identification may take several months. Paul Emanovsky, a forensic anthropologist, was flying from Hawaii to recover the body. Emanovsky worked in the 2005 investigation. The identity of the body will be established through an examination of mitochondrial DNA obtained from family members of those on the 1942 flight, Mann said, since there are no dental records available from the flight members. Hadden said such an effort is beyond the ability of a county coroner's office. The flight was one of several dozen air crashes during World War II training missions. Many of those aircraft are still missing in the 400-mile long Sierra. Fresno County Coroner David Hadden said the World War II-era crash appeared to be like many that take place in the Sierra when a plane flies into a bowl-like area and then does not have enough power to pull out. "It's like driving into a dead end," he said. Mount Mendel is a remote area well-known by ice climbers. Mendel glacier is about a half-mile wide. There are about 1,500 small glaciers between Kings Canyon, Sequoia and Yosemite national parks, the southernmost belt of glaciers in the United States. A rubble-strewn field below the summit of Mt. Mendel is shown in this undated handout photo. The glacial field is the site of a WWII-era plane crash. A body has been found. Another body was found in 2005.